The composer Witold Lutostawski (born 1913) is one of the outstanding musical personalities of the twentieth century. In this critical biography Steven Stucky traces Lutostawski's development from the Stravinsky-influenced music of his student days to his emergence in the 1960s as a leading avant-gardist. 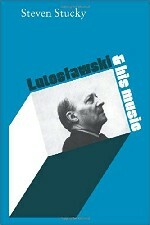 Since the vicissitudes of cultural life in his native Poland have profoundly affected the composer's career, the book includes detailed accounts of Lutostawski's official censure for 'formalism' in the late 1940s and the leading role he later played in a flourishing Polish modernist movement. Both well-known works, such as the Concerto for Orchestra, Trois poemes d'Henri Michaux and the Second Symphony, and the lesser-known early music are considered in detail. Fragments of many compositions never before published in the West are included. There are also analytical summaries of each major work from Jeux véitiens (1961) to Mi-parti (1976).